Once or twice in your lifetime, you’ll stumble across a magazine that could have been written just for you. You’ll see it, hidden away from the mainstream, out of the corner of your eye and something will immediately draw you to it. Retrofan is one of those magazines. The people, things and places that it features tug at your heartstrings and fill your dreams and each and every page explodes in a miasma of gorgeous, sumptuous design that wholeheartedly believes in the mantra that space shouldn’t be wasted and that every available inch of room should be covered in mind-meltingly lavish images and captivating, entertaining prose. Speaking of which, I’ve yet to read an article in this magazine that isn’t thought provoking and incredibly well-written. Every feature is saturated with passion for the subject matter and has been carefully and meticulously researched and composed by fans, for fans. This latest issue opens with a superb article that explores the history of The Munsters, The Addams Family and Bewitched and the effect that those shows and their ilk had on the impressionable mind of the author before kicking into high gear as Retrofan dives deep into the mythology of regional horror hosts, the Groovie Goolies, Ben Cooper Costumes and the nearly eight decade long View-Master phenomenon. 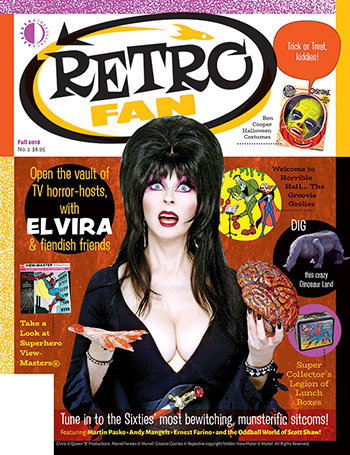 And if that wasn’t enough, there’s an interview with the Queen of Screams and Horror Host extraordinaire Elvira and a triumvirate of wonderful pieces about the short lived Dinosaur Land, Geppi’s Entertainment Museum which recently closed its doors forevermore and the unbelievably varied world of the school yard fashion must-haves of yesteryear, metal lunch boxes.